@petiteballerine Yeah, I'm lucky that my guy is a casual, outdoorsy sort. The mystic body is longer in the arms than the arsene and 28m, so that's going to be the main point of potential disaster I think. So, my Arsene's small SartoriaJ haul turned up unexpectedly, and I can confirm that the 'one-size msd' approach is absurd. This stuff is HUGE on him. Some of it will work on the 28m fine, but for the mystic, the fact that these guys really aren't on a normal 1:4 scale just becomes way too obvious. I'm really glad I ordered custom tailored jeans from another source. A couple of the sartoria tops will work as appropriately oversized rather than 'swimming in clothes made for a larger doll', so that's something at least. In future, I'm gonna be sticking to chewin and some other fashion doll sources for these guys for sure. Even if over-all dimensions weren't an issue, the 1:4 hem standard is just absurdly out of scale on these guys. I think more of the problem is that most of SartoriaJ's 1/4 male clothes default model is the Iplehouse FID (muscle body), which is 49.5cm tall and has a chest measurement nearing SD13/17. Which is bigger than 1/4 scale. The clothes don't really work for the 28m either. The 18m and 28m are closer to 1/4 scale, SartoriaJ's main default model for the male clothes is not. Only the SartoriaJ clothes labelled as for Dollshe only really fits them. Oh, on a side note, I find the sartoria shoes bulky as well. I'm gonna dig through what I have for male 17-18" fashion dolls and see what turns up. @rianne - My guys have no shoes, so I will look forward to your findings haha. I was never able to find much for clothes but chewin, and the only place that custom sized just off measurements and the stuff actually fit was stacy's pink ocean (though I don't know what models they actually own, and the style of their clothes is very specific). I currently have a pair of Kinsman skinny jeans made by hazelstreetdezigns on one of the mystic bodies I have. They fit great (can sit too! ), but the bottoms of them took a bit of finagling to get them over the heel. Next time I will take off the feet first. I will have to get a pic of them. Edit: Here is a horrible nighttime photo of them. The shirt is also made by hazelstreetdezigns. @rianne- I got these jeans off ebay from mbayer. They are a really good fit on the Mystic body AND Arsene! Got them in 2017 and haven't seen any like them on their store since. CarrieLi's House Store on Aliexpress has some very similar if not the same pattern. Lot's of colors, affordable, and the measurements for MSD check out the same. The shoes are Vans slip-ons, easily found on ebay. They're the only shoes I have that fit this foot. I want a solid red pair if they ever are offered. Man, you guys are awesome! Oddly, a pair of Volks msd boxer-briefs fit like they were made for this guy, so I'll get photos up of those when I take photos of how oversize the sartoria stuff is lol. I hope this is ok. I ended up doign a small underwear shoot, so for anyone who's interested, this is how the Volks boxer briefs fit my boy's Mystic body. 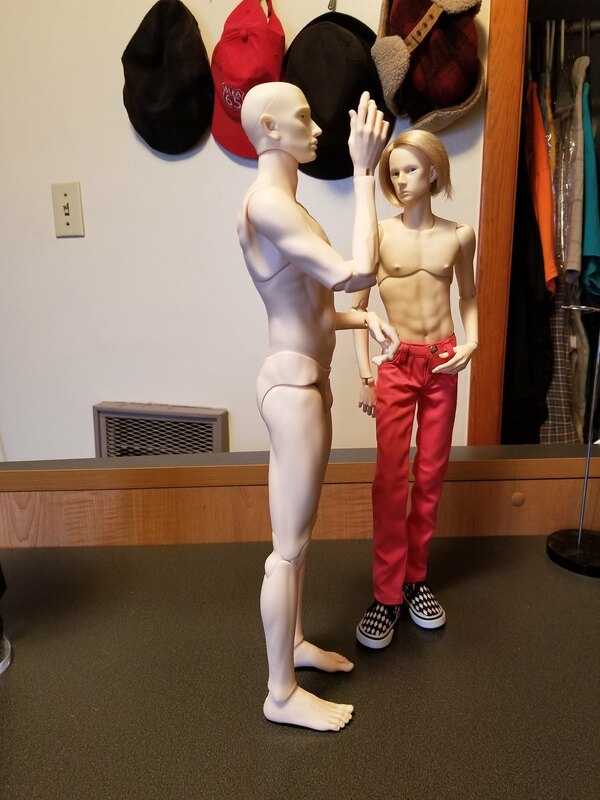 @rianne - several people have found volks msd items fit their fashion men. there are pix way back somewhere. good to know things fit the mystic. it is hit & miss. Nox finally has stuff that fits. Kinsman tops from hazelstreetdesigns and jeans custom made for the Mystic body by jeansbyjenna. I have some peter pevensie boots that work too. They're still bulkier than I'd like, but better than the stuff made for bjd. Sorry for the double post. Ended up dragging more stuff out. SartoriaJ stuff is straight up the wrong size, as you can see. Button up I didn't even bother taking out of the packaging. The collar, buttons, hems, everythng is out of scale, even if the large fit might have been ok for. an oversized look. Love the tissue type t-shirts sartoria makes, but this is straight up a dress on a Dollshe guy. Kinsman shirt from hazelstreetdesignson the left, sartoriaj on the right. sartoriaj on the left, PP on the right, next to mystic feet (which are the longest of all Dollshe feet except for Khan I think). very helpful info on SartoiaJ. I bought a couple dresses for FID and since they were stretchy, they fit Dollshe fashion girls. but, without a specific photo on their site or someone posting the exact item on their doll, I wouldn't buy from SJ. lovely things, but useless if they don't fit anyone. and, I dislike huge buttons. I have a Tonner Matt O'Neil shirt that looks nice on 28M fashion men, but way out of proportion on Arsene. oh, gosh @rianne - love how you painted his feet! Hehe! I have those Peter Pevensie boots too. The scale of buttons/snaps on tops like these (and other shops) are a major pet peeve of mine. Why use the same ones on MSD and SD? It just looks ridiculous. I have to agree, I love the feet blushing! I need to find the time to blush my flip flop feet. Thanks guys! I adore Dollshe feet and I knew this guy would be going barefoot a lot, so I went all out haha. XD But yeah, I'm 100% sticking with what I can scrounge up in kinsman/matt size or from chewin's line for my incoming 28m dude. Please post your 28m findings too when you get him. @xyuemoto I definitely will, but it will probably be a year or so haha. My 28m is a rey lewis, and last I knew, Mr. Kim hasn't started the new molds for that sculpt.